We hope that you are enjoying the first steps towards spring! The sky stays light later, birds are chirping, and our children are edging towards the next grade. For Kristi, the spring thaw is also bringing opportunities to study the active construction site next door to the school, and a renewed sense of purpose to inquiry. Inquiry is one of the areas that Kristi wanted to focus on when she returned to the classroom. How do you teach children to cultivate thoughtful wonderings, develop theories, and follow those theories up with study to confirm or revise them… all while teaching the social studies and science content for the grade? Inquiry can exist with different amounts of scaffolds: the teacher can choose the topic and guide the inquiry, or the entire study may be driven by student interest. Kristi knew that kindergarten was entering the neighborhood study, but she let the children’s natural curiosity drive what part of the neighborhood they studied. Of course, the construction site right next door drew the most amount of lingering attention, and so the construction site inquiry was born. 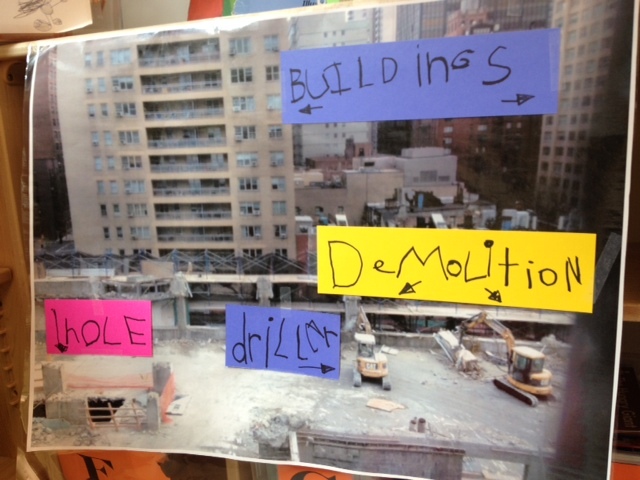 One of the first things the class did was visit the site to observe and sketch what they noticed. At the same time, Kristi took photos. She printed and enlarged the photos and the class studied them. 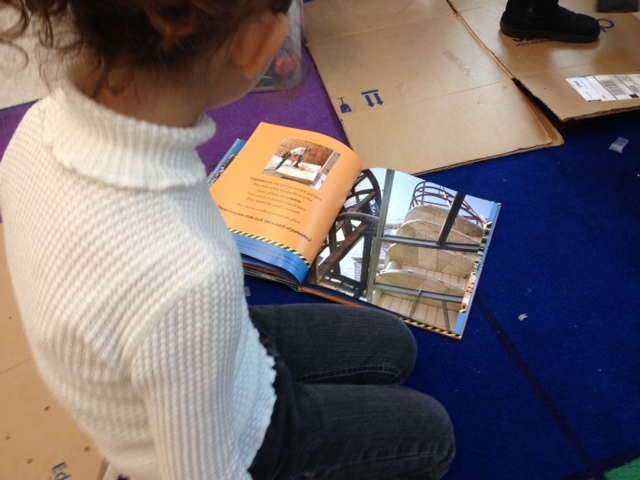 As they read books about construction, and interviewed people connected with the site, they labeled the pictures with their new knowledge and vocabulary. As the process went on, the questions children asked changed from, “What is that?” while pointing to a machine, to bigger questions like, “How do they know how to make the building?” which has led the class off in the direction of architecture and blueprints. 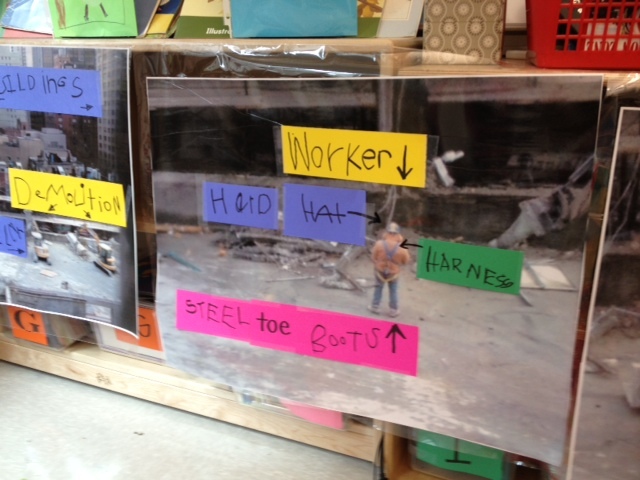 After a few visits to the construction site, children began to replicate some of what they had seen in choice time. In this way the vocabulary was used and reused. To help children imagine the possibilities, Kristi taught a choice time lesson that showed them that you can make what you saw on an investigation! 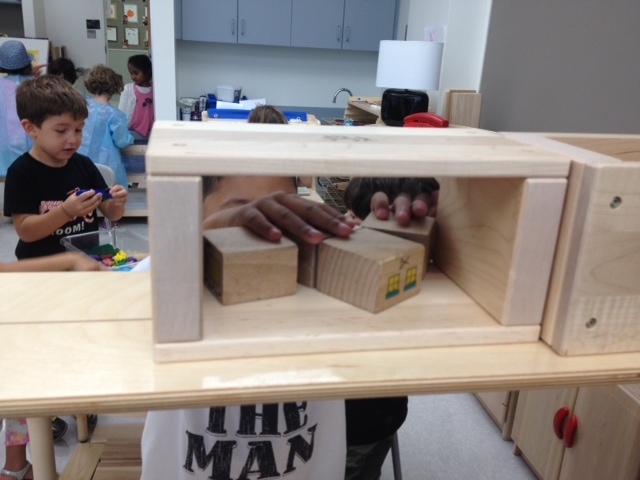 Construction is everywhere in choice time now: blocks, legos, and even in cardboard! 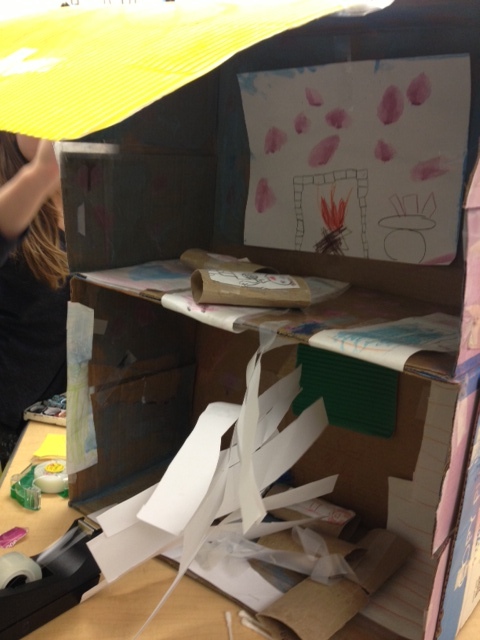 This is a two story cardboard dollhouse, made by two students, complete with people! The class inquiry is continuing on in the direction set by the children-blueprints and models-and Kristi is referring again and again to the standards for social studies to ensure that she is also covering the requirements through read aloud, interviews, and videos. Happy charting, and happy inquiring! Hello again! Thank you everyone for your warm wishes and positive feedback on our webcast on Education Talk Radio with Larry Jacobs! If you did not have a chance to hear it, or would like to hear it again (and again and again) you can find it archived here. We here at Chartchums have been busy; Marjorie just presented at a literacy conference in Boca Raton, Florida and Kristi has been ear deep in fingerpaint and emergent literacy. One of the wake up calls for Kristi as she moved back into the classroom has been the world beyond literacy. Social studies? Math? But there is one constant that carries through them all: if you want children to remember what you have taught, and work independently, you need charts. As you look through these charts, you will see many of the themes we have discussed in literacy charts: clarity, use of visuals, and color. 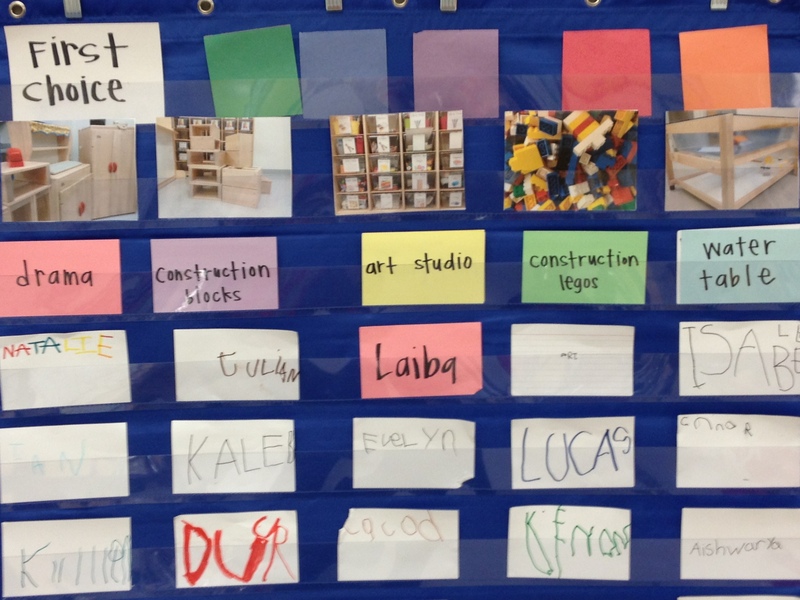 The fundamentals of useful successful charts remain the same regardless of content.Here are some thoughts, ideas, and snapshots from Kristi and her wonderful Kindergarten classroom at PS 59. PS 59 in Manhattan operates under the wise direction of principal Adele Schroeter and assistant principal Alison Porcelli. Along with being brilliant, thoughtful, and ethical leaders, Adele and Alison are former early childhood educators that believe strongly in the power and impact of play. Play is not separate from learning, play IS learning. You can learn more about making the most of play in Alison’s book, coauthored with Cheryl Tyler, entitled A Quick Guide to Boosting Language Acquisition in Choice Time available for purchase here. Part of the beauty of choice time is the way it mirrors the work happening in reading and writing. We use the same words: plan, revise, build stamina, and it follows the same structure: short lesson, followed by ample time to create, then a share at the end. Children select their center on the choice board (the photo shows the top half, cardboard construction is an additional center on the bottom half – not pictured). The top section has the rug colors and matches the children’s rug spots. The order of the color squares indicates the order of the children choosing centers and rotates daily. Children stay in their center for 45 minutes. The pictures, routine, and daily use of this tool make it one that can be used independently by children. 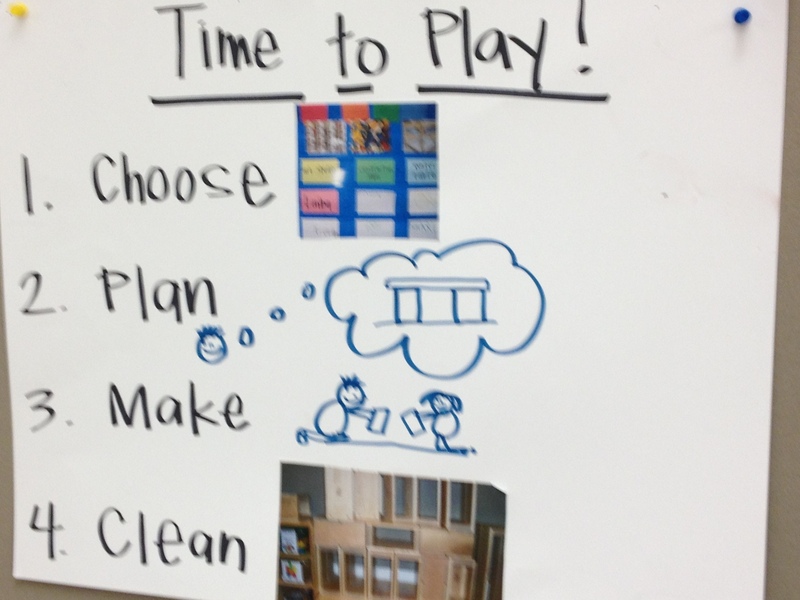 What makes choice time different, is that we ask children to plan with their centers before they play. Children in the same center gather on the rug and decide what they will create, what they will need, and who will take each part. 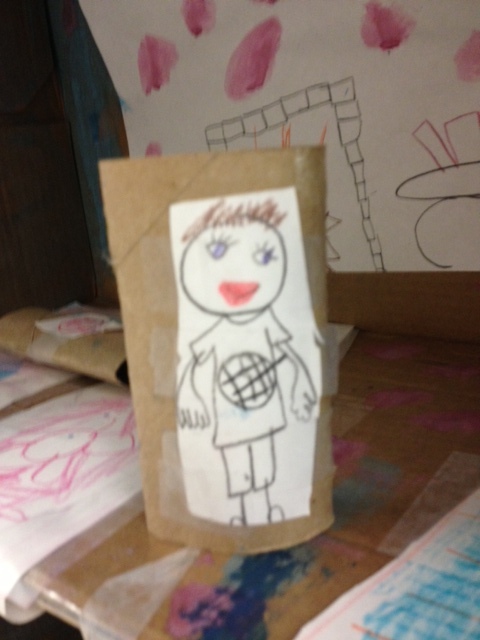 In the cardboard construction center children recently made a 6 foot long double decker bus, with one child working on the outside, one working on the steering wheel and buttons, one working on seats, and the final child making signs for each stop: Empire State Building, Statue of Liberty, etc. These plans often undergo revision, which is a wonderful analogy to share with children in writing. “Remember when you realized you didn’t have enough room to make the zoo in blocks so you moved it? That’s kind of what we do in writing workshop when we add more pages!” The simple language and accompanying text make it easy for children to use. 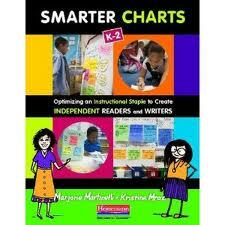 It also mirrors the reading and writing routine charts in the room, making it three times as successful. Part of the kindergarten curriculum is learning about community. One aspect of community is finding ways to work and live together. I learned about the “problem scale” from my brilliant colleague Kat Cazes. Kat is incredibly thoughtful when developing tools and charts for children. The problem scale has two parts: the type of problem (glitch, bummer, and disaster) and ways to solve these problems. This scale is hanging in the Solution Center (salushen chenter). 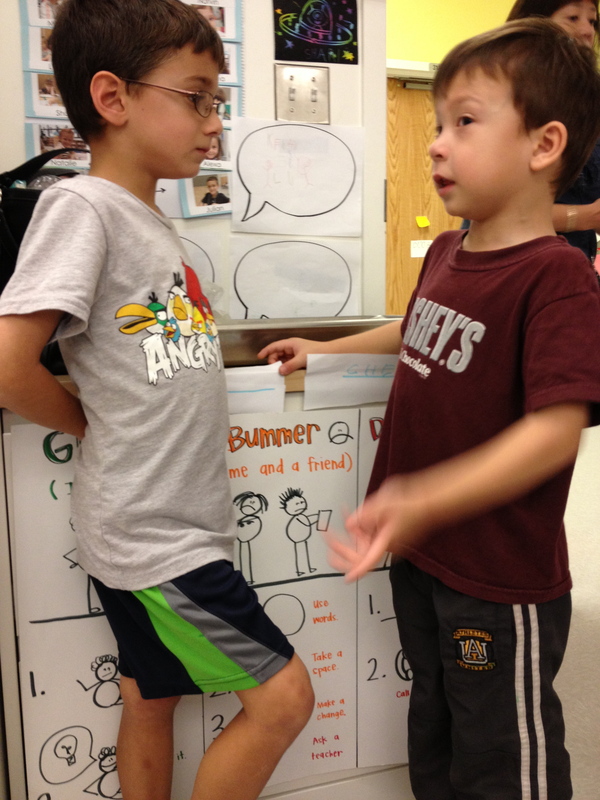 When two or more children encounter an issue, they bring it to this area and talk it out. There is a classroom job called “Peacemaker” who assists in solving problems. 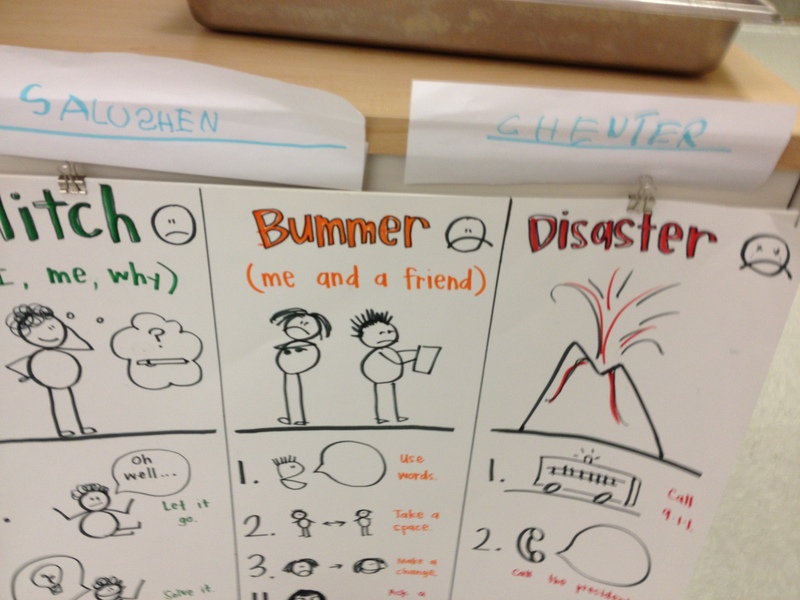 There are clear pictures, and color coding to help children understand the severity of each problem. Glitch is green because it is simple to solve. Bummers are yellow/orange, because you have to slow down and take some time to solve them. Disasters (like a volcano) are red because everything stops to solve them. Each step to solve problems is simply illustrated to assist in independence in this area. This sign was made during choice time at the art center by a child who wanted to make a gift for the class. Interestingly enough, she made a companion sign that said “No grabbing” in red (the opposite of this green sign), already using some of the color cues in the classroom and the world. Another beautiful aspect of PS 59 is the emphasis on learning through inquiry. Valerie Geschwind, an incredibly smart, talented and accomplished teacher sets a beautiful model of using inquiry in the primary classroom. In her school study she has taken her class on several trips to the main office, even bringing back a walkie talkie the children can study and sketch over time. Valerie also has recurring “Think Tanks” where her kindergarteners gather around and talk about what they are learning about the school. Together she and the other members of the K team developed a chart for children to teach them more about the process of inquiry or investigation. Accompanying this version of a chart is an arrow that helps the class track their way through their investigation. The simplicity of language, clear and consistent picture cues, and color choice helps this chart become a tool for children. 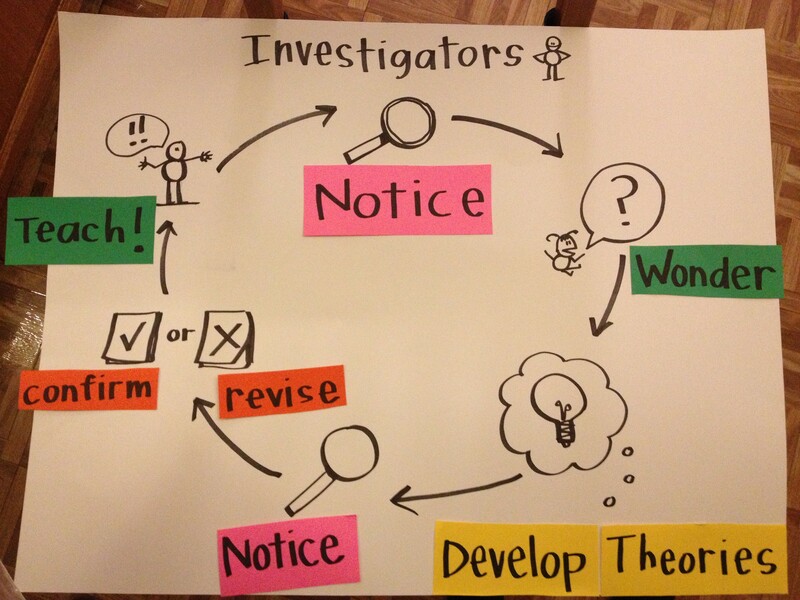 For more information on the inquiry process in the primary classroom, you may want to check out Young Investigators, available for purchase here. 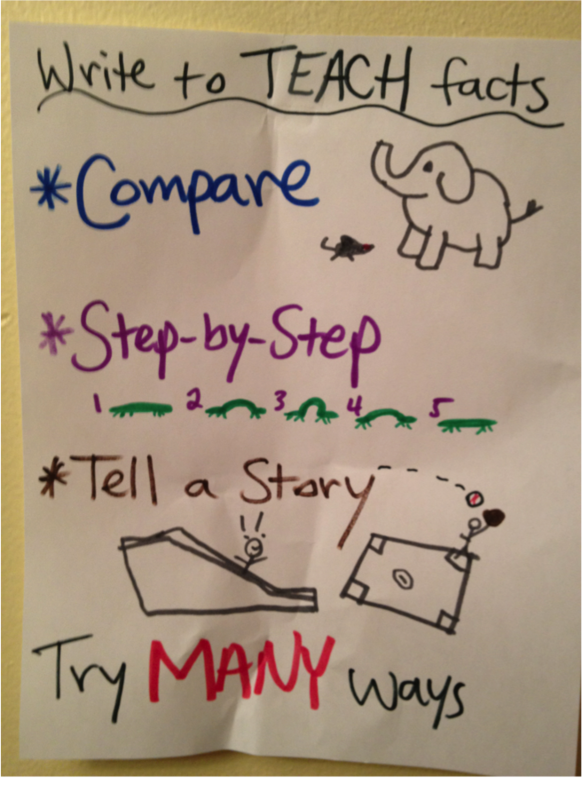 Below are a few classroom charts emphasizing the importance of drawing in writing workshop. We at chartchums cannot emphasize enough the importance of spending time studying and teaching drawing to writers. 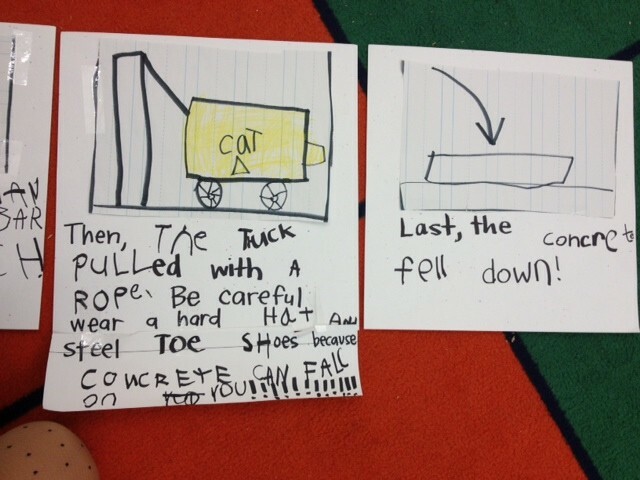 The work children do when representing a scene in pictures is no different than the work they do when composing with words later on. Katie Wood Ray has a beautiful book on this subject called In Pictures and In Words. This student is an English language learner who does not yet write conventionally, but through an emphasis on drawing as a representation of ideas, she has clearly communicated a scene. This book was made after several short lessons that emphasized drawing. 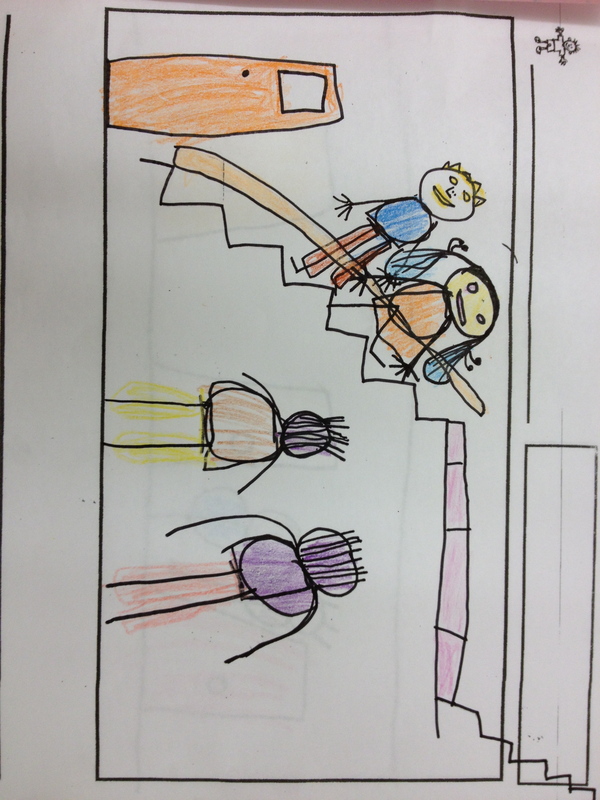 Note the movement up the stairs, the backs of the people watching, and the thoughtful and intentional use of color. Many of these things were modeled repeatedly on class stories, taught in short lessons, and noticed in books. This chart deals directly with writing stories. The big ideas are simple and uses one word for easy reading. 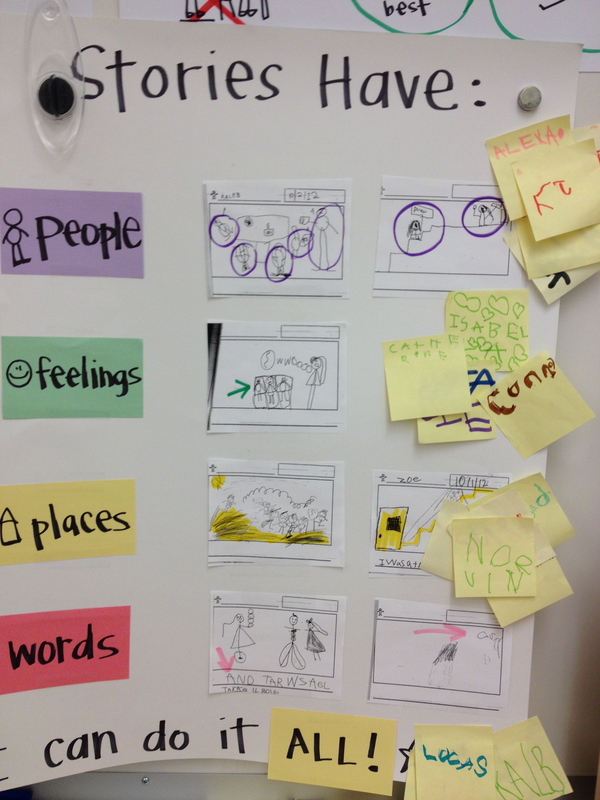 The color coding helps children identify what the big idea looks like in context. The post-its were put up by children to indicate the thing they wanted to work on that day. This chart has been reread many times in shared reading and also referenced during reading workshop to increase “stickiness”. 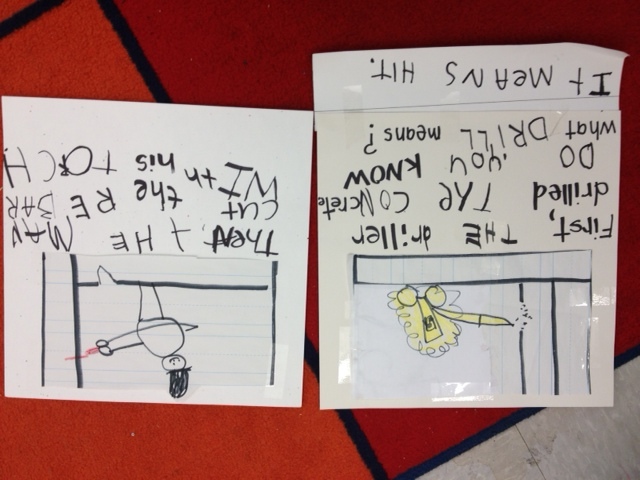 Katie Lee, Mollie Gaffney, and Kat (three lovely and smart teachers) also have pages from read alouds on their charts. It is beautiful to look at their charts and see a child’s work right next to a a page from Caps for Sale! 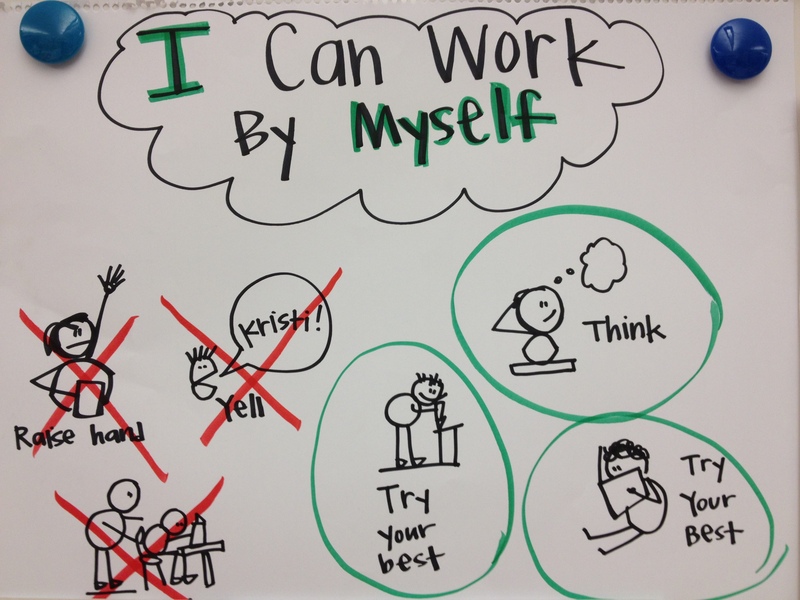 Kristi also added a photo of this chart in her parent letter as an easy way to let parents know what their children are working on in writing. And last but not least, developing independence! The above chart started as just drawings and the children helped determine what should be green and what should be red. Accompanying it is a hat that Kristi wears when children need to be working independently: one side is red (closed for business) and that side is up when the she is conferring and meeting with small groups. 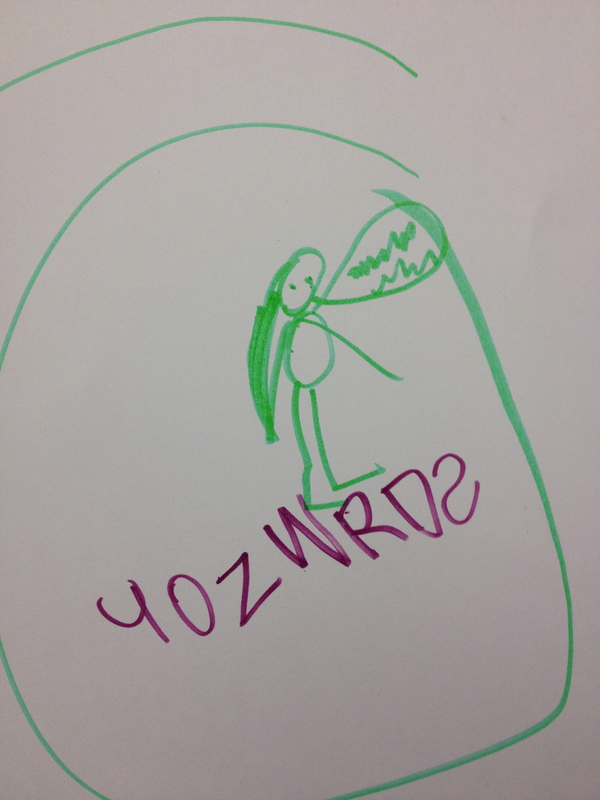 The other side is green (open for business) which indicates the teacher is available to meet with anyone who needs her. The hat is almost now always worn on the red side, as children’s independence and confidence in their own problem solving has increased substantially. Keep your eyes peeled for future math charts, guest posters, and even a book giveaway! As always, send us charts so we can share them with the world. Until next time, happy charting! Chris also has an active education-focused twitter account – @iChrisLehman – we suggest you give him a follow. Without further ado, please join us in welcoming, Chris Lehman! It is such an honor to post with Chartchums, not just because I think Kristi and Marjorie are two really brilliant people—who are awfully funny, I might add—but because the mission of this blog/community/love-fest embodies all that research should be: digging deep into a topic you love, grabbing every single piece of possible information you can, and then sharing it with others. “How can we harness the visual power of charts to support our students’ independence” is a battle cry for teachers in this community; in every post (and every post comment!) we see that call being answered over and over. Researching a cool topic—like charts—isn’t just fun, it’s an essential life skill. In fact, the Common Core expects that every child will research “to build and present knowledge.” From shared studies and writing in kindergarten, all the way up to intensive, individualized research with cited sources in upper grades, every child should learn to find information they need, learn from it, and share that learning with others. But here’s the thing. Walk the halls of nearly any school and you are certain to find projects that, though colorful and well-intended, are either plagiarized directly from sources or are filled with regurgitated facts formed into the shapes of paragraphs. Even more concerning, walk up to any of the creators of those posters or essays or booklets and ask, “Can you tell me about your topic?” and a great percentage of them will look at you as if you are out of your mind (imagine a typical pre-teen look of disgust here). There is lots to say about this topic, but here are two ideas to consider. First, students come with loads of expertise, even in methods of research. Secondly, writing about research is about teaching others, not just proving you read something. I’d love to hear what things each of you do in your schools, too. Often times in an effort to “help” we—how should I say this?—“over-help.” We dole out itty-bits of strategies on a daily basis, almost forcing students to wait for each new nugget, even when they may already know how to do it. Take for example, nonfiction reading. If we begin a first grade nonfiction unit by saying, “We’re now going to start a brand new type of reading in this unit. One you have never done before. It is waaaay different. It’s called ‘NON-fiction’!” we don’t take advantage of what children already explored when reading nonfiction in kindergarten. We can unintentionally act as if it’s brand new every year, even up through eighth grade and high school sometimes. Studying research is no different. So consider letting your students show you what they already know about research writing, before diving into instruction. Here’s a version of this idea I had the pleasure of teaching with a 5th grade inclusion class in Harlem. We set up bins of nonfiction books on tables, some chart paper (yay! ), kids arranged in partnerships or groups, and then took a few deep breaths to prepare us for whatever ride the class took us on. 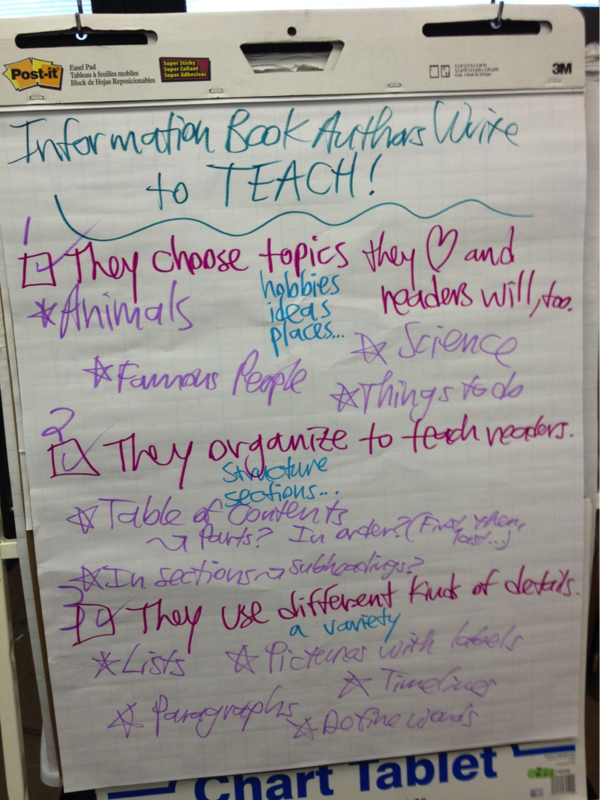 Information Book Authors Write to TEACH! • They choose topics (hobbies, ideas, places) they LOVE and readers will too. 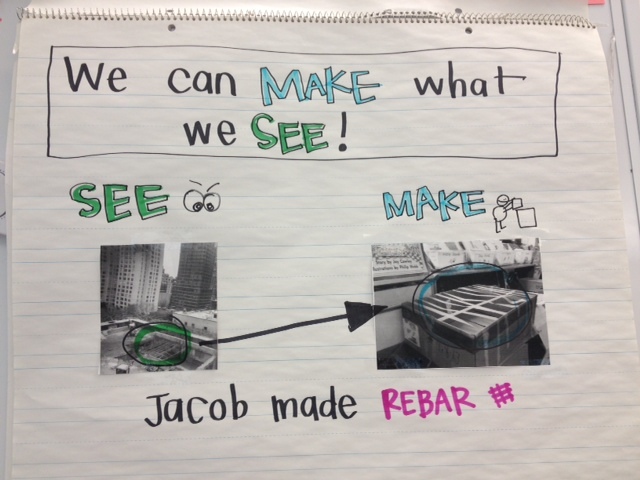 • They organize (structure, sections) to teach readers. • They use different (a variety) kinds of details. 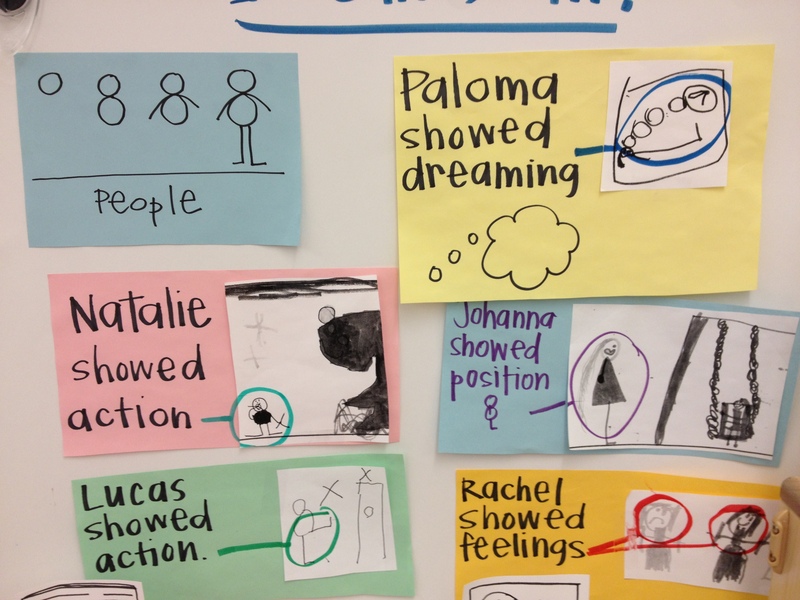 This chart not only captures the excitement of the children’s discoveries, it provides several strategies they can draw upon as they begin their own research reading and writing. Inquiry work is often a messy process when kids are in the midst of making discoveries. Brainstorming needs to be fast and it is more important to capture these erupting ideas than worry about how the chart looks. As students get further into their experiments, they can then revise or create new charts with examples from books or from their own writing, with hand-drawn illustrations, or with photographs of themselves in action. Handing over some responsibility is always harder on the teacher than on the students, but the results are usually increased agency and ownership of the work being done in a classroom. You then could teach students to experiment with many different ways to teach the same facts. Seeing which way can best teach others. Here is a version of a teaching-through-writing chart for younger researchers. This chart uses visual examples that illustrate each strategy for teaching more about a fact which will make each fact more interesting to the reader . Practicing ways of teaching-through-writing is not only good for leading to way, way, way better writing about research, but is also terrific for learning. The repeated practice means students are interacting with facts and ideas over and over, manipulating them in different ways. Research is fun again, charts help hold onto what was discovered along the way, and all of that work leads to what it should—greater expertise. Yes, you really can draw!